If you or your cat is suffering from allergies, there are a number of things you can do to help keep allergic reactions under control and minimize discomfort. One of them is to reduce the potential allergens on your feline’s fur to a minimum by wiping it down regularly. There are special hypoallergenic cat wipes on the market which are a convenient solution that helps to remove cat litter, dander, dust, residual saliva, and other dirt in no time. They are an easy, quick way to keep your pet clean and allergen free. What Are Hypoallergenic Cat Wipes? Hypoallergenic cat wipes are pre-moistened wipes that offer an easy alternative to a daily bath. They can clean, condition, and deodorize your cat’s skin and coat with very little effort. In contrast to regular pet wipes, hypoallergenic wipes typically contain fewer allergens and as such are less likely to cause allergic reactions. Brushing your cat right after wiping them down, helps with their enjoyment of the wipes. Burts Bees Dander Reducing Cat Wipes are gentle cleansing wipes made with Aloe Vera to moisturize dry skin and reduce flaking. The wipes are made with natural ingredients. They contain no sulfates, colorants or artificial fragrances and are safe for your furry little friend. The product is damp but not dripping wet, as such the wipes are wet enough to make an impact on your cat’s coat. They are very effective at removing litter dust, dandruff, and other dirt and thus reducing potential allergens. The moisturizing effect of the wipes will additionally approve the appearance of your feline’s coat leaving it soft and shiny. The wipes are pH balanced for cats as their skin is much less acidic than humans. In addition, they will not wash off topical flea & tick treatment when following manufacturer’s directions. We highly recommended this natural made in the USA product for your peace of mind and a happy allergen free cat. 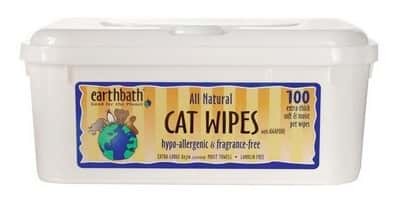 Earthbath All Natural Cat Wipes help to easily wipe away litter dust, dander, dirt and other potential allergens in your furred friend’s coat. The wipes do not contain added fragrances, as a result, they are basically odorless. In addition, they do not contain parabens, phosphates or phthalates. They are safe for daily use and any residue left behind is completely safe and will not harm your cat. The wipes are not overly wet (more on the dry side) and their size can be considered “normal”. They contain a mild cleanser that freshens and deodorizes. In addition, Aloe Vera and Vitamin E will moisturize coat and skin. The product is nice to use for general kitty coat cleaning and will brighten and soften the coat. This product is made in the USA, as indicated on the package label. It is alcohol-free, safe for all cats and kittens over 6 weeks old. It also does not remove spot-on flea control treatments. One potential downside of the product is the packaging. The top latch/button of the box is reported to not always stay closed. As a result, some wipes may dry out before you finish the container. A small tip here is to keep the entire box in a zip lock bag. Nature’s Miracle Just for Cats Allergen Blocker Cat Wipes claims to neutralize allergens by breaking down the structure of inanimate allergen proteins. This is done by what the manufacturer calls an allergen blocker complex which is a proprietary formula that uses aluminum salts to deactivate pet dander. The product has a very mild scent and deodorizes your cat’s coat. The pre-moistened wipes will not leave your kitty sticky or soaking wet and are perfect for wiping down your pet in order to neutralize potential allergens. In addition, the alcohol-free formula will not dry out your cat’s skin and coat. The product is packaged as a roll and comes in a cylindrical container. The wipes are fed from the center of the roll through a dispenser but in some cases, it is not that easy to get ahold of a center wipe. A solution is then to open the canister and pull the wipe from the outside roll but this kind of defeats the purpose of the dispenser feature. The above cat allergy relief wipes are all excellent products with high user review scores on Amazon. 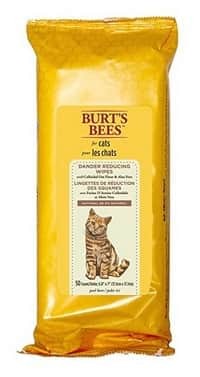 We chose Burt’s Bees Dander Reducing Grooming Wipes for Cats as the best hypoallergenic cat wipes. Made with natural ingredients and pH balanced especially for cats they are a safe and quick solution for daily removal of potential litter allergens on your kitty’s coat. As allergies are different for each person or cat it’s hard to say whether they will bring relief or not. Given the fact that they are not that expensive, we recommend you give them a try and hopefully, they will work out for you and your feline friend. What are your experiences with allergy reducing cat wipes? Did one of the above suggestions work for you? We’d love to hear your feedback!